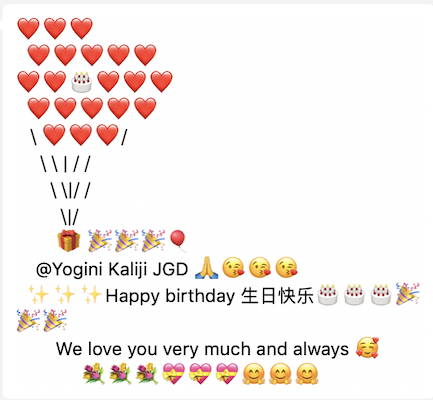 Home/News & Events, Uncategorized, with Kaliji/Happy Birthday Yogini Kaliji! Today would be just about dawning in your part of the world. A date on which this world was blessed by your presence on it. The world rejoices on this day and so do we. Pushpa joins me in extending our affection, full of prayers, for your long, healthy and blissful life. May this date continue to come year after year after year. May you continue to shower your blessings and divine knowledge on the world and may we continue to be one of your loved ones. Always. It is a happy, happy, holy day. All across the planet people wake up on April 11 and give thanks for your birth this wondrous day. The blessing of your coming to Earth to share ancient wisdom and timeless truth cannot be named by words, but can be felt in each and every heart. You wake us up, you show us by example, you hold patiently to eternal truth and highest knowledge and infinite bliss while we try to comprehend the vastness and potential for life that no one told us about before. Or if they did tell me…I forgot to remember and am so thankful you woke me up again. I am so blessed to be in the presence of your life on Earth, as you walk this human path and show me how to do it so beautifully. I treasure all the teaching, I welcome all the learning, and I give tremendous thanks for your entrusting me to share with others what I have learned through you. Thank you for all that you do to inspire me, energize me, and calm me. Thank you for bringing forth TriYoga Flows, music, Prana Vidya, vegan awareness, jnana, and a worldwide community of Flow-ers, who are my friends and my family. Thank you for giving your every breath to this path, for knowing what is real and true, and for teaching it to me, and to everyone. April 11, 1955, is the day a comet of love and light blasted through the wall of density and darkness. I thank God for the gift of Kaliji on Earth. Wishing you a perfect day of celebration and joy. Aloha Sri Kaliji, It’s a happy happy holy day. Eternal gratitude and love. Happy Beautiful Birthday Yogini Kaliji! So grateful for you and us to be on this planet at the same time. Humble pranams. Happy birthday to my beautiful guru, Yogini Kaliji. I will forever be grateful to have you in my life! Offered prayers of thanks for you this morning as I hold you close this day on your birthday. So grateful you are in my life and opening the way for so many in the world. Deepest of blessings in the day and year. We wish you a very happy birthday dear Kaliji! Your words have inspired many people, your actions have moved even more! You truly are an exemplary Guru / Friend /Mother. One that I am truly proud to call mine. Happy birthday! Happy to be following your path with TY… greatest gift! Dearest MATAJI, this is when I looked today at my telephone screen to see all 11s and thought about Your birthday! The most auspicious, extraordinary, intuitive, knowledgeable, loving Person I know; the Grand Gift of my life to be in contact with You. Pranams to You and wishing a great ambience for celebration today and more miracles to follow! There is not a day I am not grateful of you being in my life and for all the priceless knowledge you have given to me! It can’t be measured by any fortune, it is beyond, beyond, beyond ….